Kepler-10: Kepler’s first rocky super-Earth, with a transiting Neptune further out. 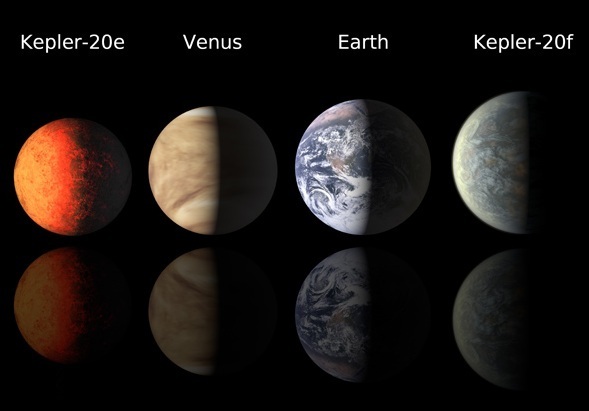 Kepler-11: A system of six transiting super-Earths with anomalously low density. Kepler-14: A massive hot Jupiter in a binary system. Kepler-16: The first transiting circumbinary planet around an eclipsing binary star. Kepler-18: A system of three planets: A super-Earth and two inflated Neptunes in a 2:1 resonance. Very similar to Kepler-9 but scaled down in masses. Kepler-19: A transiting sub-Jovian planet and the first case of the discovery of a second planet through transit timing variations in the transiting planet. Kepler-20: A system of five planets, two of which are ~Earth-sized. Kepler-21: A transiting super-Earth around a bright (V = 8.27) star. Kepler-22: A transiting “mini-Neptune” in the habitable zone, and the first transiting planet in the habitable zone of any star. KOI-423: First transiting planet around a subgiant star. KOI-730: A remarkable system of four planets in a 1:2:4:8 resonance. KOI-55: What appears to be two remnant cores of gas giants engulfed by their parent star during its red giant phase. 82 Eri: Three low mass planets only a few times the mass of Earth. HD 136352: Three super-Earth/sub-Jovian planets. HD 215152: Two lower-mass super-Earths. Gliese 667 C: A second planet of a few Earth-masses in the habitable zone. HD 85512: A super-Earth on the inner edge of the habitable zone. On the orbital dynamics front, in January, it was found that the HD 37124 system, which hosts three intermediate period gas giant planets of roughly equal mass, may have a 2:1 resonance for the orbit of two of its planets. Furthermore, the planet candidate orbiting Rho Coronae Borealis, one of the first planet candidates, was proven to have a true mass far outside the planetary regime. The recovery of the planets of HR 8799 in old HST data has permitted the architecture of the system to be much more constrained. A planet around a naked-eye giant star Alpha Arietis was reported in April. Later, in August, it was revealed that a new planetary mass object has been found orbiting a pulsar. On the subject of post-main sequence stars, a candidate planet was imaged orbiting a white dwarf. On the other side of the main sequence, a planet had been found in the late stages of formation at LkCa 15. Gravitational microlensing provided us some constraints on the abundance of rogue giant planets as well as another cold super-Earth. It turns out that rogue giant planets may be twice as frequent as main sequence stars. Several planets around eclipsing binaries were found this year, including planets at UZ For, HU Aqr, Kepler-16, and NY Vir. Without a doubt, one of the most exciting stories of 2011 is the discovery that one of the first known super-Earths, the innermost planet at 55 Cancri, transits its star. This is the brightest star known to have a transiting planet, and it will prove very useful for the study of these kinds of planets. While it was initially thought that the planet was rocky and iron-rich, later observations suggest that the planet must have a significant envelope of volatiles. In summary, 2011 has been an astounding year. The focus has shifted away from gas giant planets to sub-Jovian planets — Neptunes, mini-Neptunes and super-Earths. Below is a graph that shows this year’s total planet catch compared to previous years. One thing is clear: Not only is the galaxy full of planets, but we can look forward to seeing a huge number more in the near future. Confirmation of obvious extrasolar planet atmospheric variability (cloud rotations, etc).